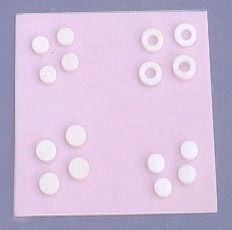 Substrates made of high performance ceramic materials E-11, E-11C, E-20 and E-37 are very useful for RF and microwave circuits due to the low loss in the UHF and microwave frequency range. Both sides can be screen printed by arbitrary silver pattern. Choose E-11 for better Q-factor or E-11C for zero temperature coefficient.